2. Cake trend predictions from Sugared Saffron! Although I'm an expert at eating cake, I'm no good at making it! I'll let an industry expert show you the 2014 wedding cake trends! 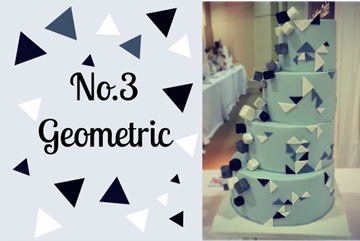 My favourite is this geometric cake, it's so edgey and quirky, I can definitely see it being featured in a maths geek wedding! Go to Sugared Saffron's site to see more! I know today has been a bit OBB overload, bear with me because they're great! Here's their extremely useful list of free templates for printing your invitations, decorations, booth props etc. etc.! Awesome! This article was posted in Wednesday Wedding World Watch and tagged 2014, cake, DIY, free, funky, how, invitations, off beat bride, planning, printables, props, quirky, resources, tips, to, trends, unique, wedding. Bookmark the permalink. Follow comments with the RSS feed for this post.Post a Comment or leave a trackback: Trackback URL.